This noodle bowl is filled with a warm gingery broth & fresh herbs, sautéed shiitakes, kale, garlic & scallions. 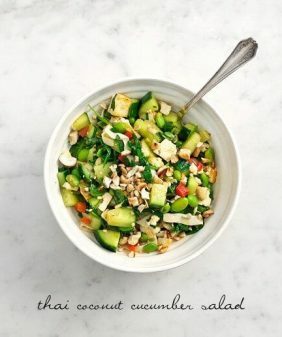 A healthy dinner in fall or spring. Vegan. Our vacation was filled with two weeks of unapologetic amounts of cheese, bread, wine, and pastries… so coming home, this is the kind of comforting meal I look forward to… healing Asian foods… shiitake mushrooms, ginger, sesame (and kale just for kale’s sake). This is inspired by a recipe of Heidi’s that I’ve made countless times in a variety of ways. 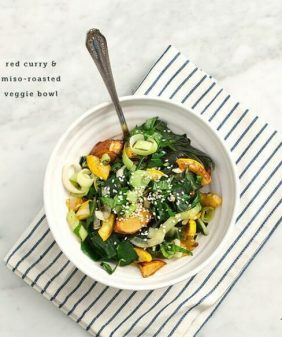 I just love the basic flavor idea – simmering ginger broth kicked up with lime juice, basil, mint, and crushed red pepper flakes. Just because vacation is over doesn’t mean it’s time to eat boring food. I kicked up the health-factor a notch by using shiratake noodles. (If you’ve never heard of them here’s the wikipedia description). The have no carbs or calories. I know… I was scared too. I had some rice noodles waiting in the wings in case these didn’t work out, but they were delicious. The key is to use them in the right application. They won’t replace al-dente pasta, so I would not recommend using them in any kind of Italian dish. But they work well in Asian soups where you’re after a more slurpy noodle anyhow. I seared some salmon to go on top, but this would be a delicious by itself as a vegetarian meal. If you’d like some more veggie protein, add some extra edamame or seared tofu. Prepare your noodles – if you’re using the shiratake noodles, they don’t need to be cooked, but drain and rinse them. They have sort of a funky smell, so I recommend shocking them in boiling water for 30 seconds. Then drain and rinse (again) in cold water. Set aside until you’re ready to use them. In a large skillet (I used a stainless one where the sides of it are 4 or so inches high), splash a bit of olive oil. When it’s hot, add the mushrooms and a pinch of salt. Cook, stirring occasionally, until they have wilted down, 5 or so minutes. Toss in the kale, ginger, garlic, and scallions. Sauté for a few minutes until the kale starts to wilt down but the garlic is not burning. Turn the heat down if garlic and ginger are starting to burn. Add the broth, edamame, and noodles and simmer for a few minutes. If your veggies are soaking up all your broth, add more. Turn off the heat and stir in the soy sauce, basil, mint, lime juice, and red pepper flakes, if using. Taste and adjust seasonings. To cook the salmon: Season the fish with salt, pepper, and olive oil and press some sesame seeds on top. 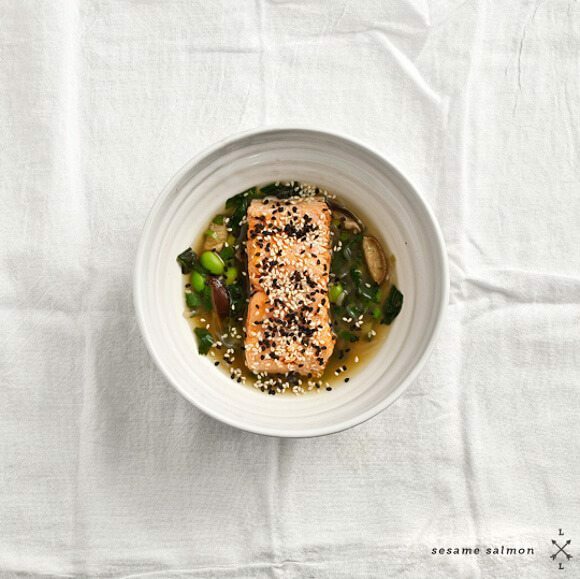 In a hot skillet, place the salmon, sesame seed side down, and sear so a light crust forms – 2 or so minutes. Some sesame seeds will fall off, that’s ok. Flip the salmon and continue cooking until it’s more (but not completely) opaque in the middle, about 4-6 more minutes. 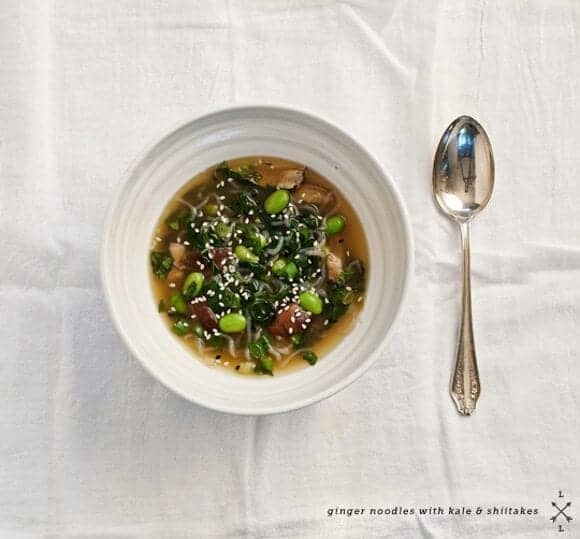 Serve on top of bowls of ginger noodles. Sprinkle with more sesame seeds if some have fallen off. The flavors here sound great and very soothing indeed. Hope you have recouped! 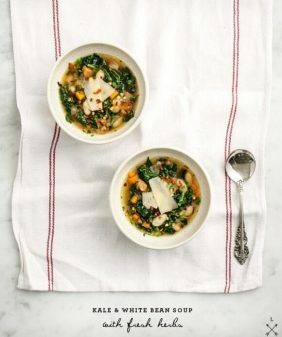 Sounds delicious but I’ve no idea how much broccolini to use, as the amount isn’t included in the recipe. How much broccoli I should I use? oops, I typed that wrong, I didn’t use broccolini this time (I have before so I happened to have it pre-written in my instructions). Really, you can use whatever veggies you like or happen to have on hand. This time, I just did kale, edamame, and mushrooms. Shirataki noodles! – Something new to try, thanks for the idea. I love this kind of soup. I crave it when I am sick–so much more interesting and flavorful than the standard chicken noodle. Pinning now. WOW I can’t wait to make this! The flavor combination sounds amazing!!! Thanks for another great recipe!!! My gosh this looks incredible. I love how comforting it looks too. Yum. I crave the same healing, typically Asian, foods after a vacation/indulgent food bender. I love the brothiness and strong flavours here. And I’m so stoked to try shiratake noodles now! This is the first thing I plan to cook. Good call. I’m a huge fan of shiritaki noodles–I ate them almost every day after my last baby. They helped me loose my baby weight. I agree, they don’t quite replace al dente pasta, but they go great in asian-style dishes, like this one. This is such a beautiful and simple meal – my kind of weeknight dinner! I just so happen to have a package of those noodles in my fridge – I feel an asian inspired soup is in order for dinner tonight! This looks delicious! I plan on making this as soon as the weather gets colder. Oh my goodness, this looks divine. 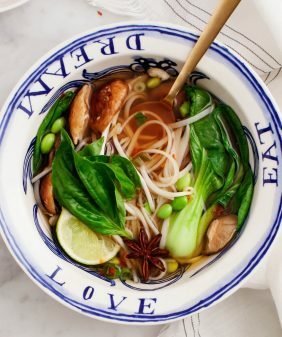 After a month of indulgence, I have been on the hunt for tasty clean food, and this broth seems just perfect! 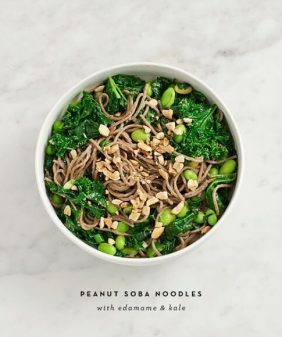 I have been a little wary of shiritaki noodles, especially as they’re so trendy and marketed to people as a “skinny” alternative to pasta, but this dish has convinced me to give them a try. A beautiful recipe! Just found your blog and read all the way through every post! We are not vegetarians (or pescitarians) but I have been so inspired by your posts and have already begun thinking of ways to mix these ideas I to our usual line up. This recepie looks delicious and I wanted to add that we love these noodles too, though my boyfriend habitually refers to them as “space noodles”! 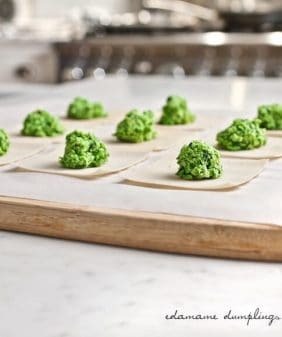 They make a great alternative in a lite, Asian inspired dish though I would have to agree that they would not be a good substitute in a hearty italian dish.